One phone call changed Bob Cimbollek’s life. Cimbollek, who had graduated from Bangor High School in 1955 and was waiting to get drafted, got a call from Del Merrill at Husson College. “He told me he thought I might be a late bloomer,” said Cimbollek, who had played organized basketball since fifth grade and had recently grown several inches. 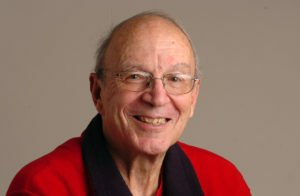 Cimbollek not only made the team, he scored 1,152 points and led the squad to a Maine State Small College Championship and Northeast College Conference title in 1956 — when he was named NCC Player of Year — and another NCC title in 1957. In those days that Cimbollek jokingly calls the dark ages, he says the clock only stopped on fouls, timeouts and jump balls. While playing 42 career games, the eventual captain set numerous career records, including — points (1,152), scoring average (27.4), field goals made (402), field goals attempted (746), field goal percentage (.539), free throws made (348), free throws attempted (458), and free throw percentage (.760). For his feats, Cimbollek was inducted into the Husson Sports Hall of Fame. And in 2015, the school retired his No. 12 jersey. Cimbollek also is in the New England Basketball Hall of Fame and he’s been honored by the Maine Sports Legends. During his 29 season of coaching, Cimbollek guided his high school squads to five state titles (two at Orono high School and three at John Bapst), six Eastern Maine crowns and a 446-161 record. Cimbollek, who says he tried to teach life lessons when he coached, is most proud that many of his former players entered the coaching ranks. The Bangor resident also is a retired high school and college basketball official and has been a basketball color analyst for radio broadcasts. He’s penned two books about the sport and continues to write the Off the Rim column for the Bangor Daily News. Basketball has been a constant in Cimbollek’s life since he was a second-grader and was fascinated watching older boys compete at recess. So he went home and asked his dad to put up a hoop. Cimbollek and his wife, Judy will celebrate their 58th wedding anniversary in August.